Does Drinking Water Make a Big Difference in Your Skin? We're told that drinking plenty of water is the key to youthful, plump skin and health, but is this really the case? While we'd like to think we're getting our required amounts of H2O every day, we wonder if this will actually help our skin get a dewy glow or if we need to be doing more. To find out the verdict on this hydration conundrum, we turned to the pros. Caroline Cederquist, MD, author of The MD Factor Diet ($15); dermatologist Joshua Zeichner, MD; and board-certified dermatologist and surgeon Margarita Lolis, MD, told us the real truth. Here's what drinking water really does for our skin. Does Drinking Water Actually Hydrate Your Skin? "Yes, but it is also the combination of eating a well-balanced diet in lean, adequate protein, and healthy fats along with staying hydrated," says Cederquist. Lolis has a different hypothesis: "While everyone says drinking water is important for overall health and doctors across the board recommend more water and less caffeinated or sugar-packed beverages, there's a lack of research actually proving water consumption impacts skin hydration or overall appearance in people who are healthy. The truth is that when you drink water, it doesn't automatically go to the skin. It hydrates cells once absorbed into the bloodstream and filtered by the kidneys. So at the cellular level, drinking water is great as it flushes the system and hydrates our bodies overall." Use a gentle cleanser as opposed to soap. Steer clear of skincare products that contain alcohol. Avoid exposure to dry air, perhaps using a humidifier. Avoid long, hot showers or washing dishes without gloves, limiting exposure to heavily chlorinated water. Apply a body cream after a shower or a hand cream after washing hands. Zeichner also notes that there isn't enough research to support drinking water will make a huge difference in the look of your skin. "It's actually a myth that drinking water will help keep your skin hydrated," says Zeichner. "There's no data to support the idea that drinking a glass of water helps hydrate the skin. On the other hand, there's no data to show that drinking fewer than eight glasses of water per day is actually harmful. The only caveat is that if you are severely do you hydrated, it will take a toll on your skin as well." Zeichner continues: "In terms of hydration, topical moisturizers can actually be much more effective than drinking water," he explains. "Moisturizers contain three types of ingredients that work together to help the skin. Occlusive, such as white petrolatum, form a protective seal over the skin. Humectants, such as glycerin or Ronek acid, act like a sponge to pull in hydration to the outer skin layers. Emollients, such as natural oils, smooth the rough edges between cells in the outer layer. You do not have to spend a lot of money to get a high-quality moisturizer." Zeichner recommends light, easy-to-spread moisturizers like Vaseline Intensive Care Advanced Repair Lotion Unscented ($3). How Much Water Do You Actually Need to Drink to Be Properly Hydrated Within? "Sixty-four ounces per day," confirms Cederquist. "I recommend 8 additional ounces for each 25 pounds a person is overweight. For example, if a person is 50 pounds overweight, they need the original 64 ounces plus 16 (8 times 2) additional ounces." "According to the Institute of Medicine, the recommendation is 104 ounces or 13 cups of water for men and at least 72 ounces or 9 cups for women," says Lolis. "However, these numbers are referring to the overall fluid intake per day and includes anything you ingest containing water, such as fruits and vegetables." Is It True When Celebrities Say That the Reason for Their Healthy Glow Is Just Drinking a Lot of Water? "Yes. However, celebrity's occupations are to look good. They have encompassed a healthy diet that incorporates a combination of lean protein, healthy fats, along with staying hydrated," explains Cederquist. Zeichner also echoes Cederquist's point that celebrities healthy glow is attributed a combination of things: "A healthy diet and lifestyle are important in maintaining overall health as well as the appearance of the skin." "Oh, there's way more to it than that," explains Lolis. "Celebrities have access to top dermatologists, estheticians, nutritionists, fitness trainers, products, and since their physical appearance is a huge contributor to their livelihood, they invest in maintaining their healthy glow. There's way more that goes into their glow than just drinking water. Water is great for us, absolutely. However, when it comes to skin looking supple and glowing, things like good overall nutrition, exercise, limiting alcohol consumption, not smoking, getting a minimum of seven hours' sleep per night, eliminating or at least significantly limiting processed foods and sugars, plus having a great skin care regimen are key factors. It also helps to have fast access to an esthetician and dermatologist who can treat any acne flare-up all are typically part of the reason anyone has glowing skin. It's never just one thing and celebrities have access to many things." What More Should We Be Doing to Stay Hydrated Within? Cederquist suggests avoiding processed foods and foods high in saturated fat. "I also suggest getting a nice water bottle and make it a habit of bringing it with you everywhere," she adds. Lolis also mentions the importance of keeping a water bottle close by. "I'd suggest bringing a water bottle to work and get creative by adding fruits to it to make it more flavorful," Lolis explains. "You can also add a shot glass of juice to a 10-ounce water bottle. You'll get flavor but significantly less sugar than if you just drank the juice. Snack on fruits and vegetables. Do the urine check. When you're properly hydrated, your urine will be pale and clear." It seems like a healthy diet can make all the difference—Zeichner is a proponent of digesting healthy eats for glowing skin. "A well-balanced diet full of antioxidants and omega-3 fatty acids help provide the necessary building blocks for healthy skin cell function," he explains. Done and done. 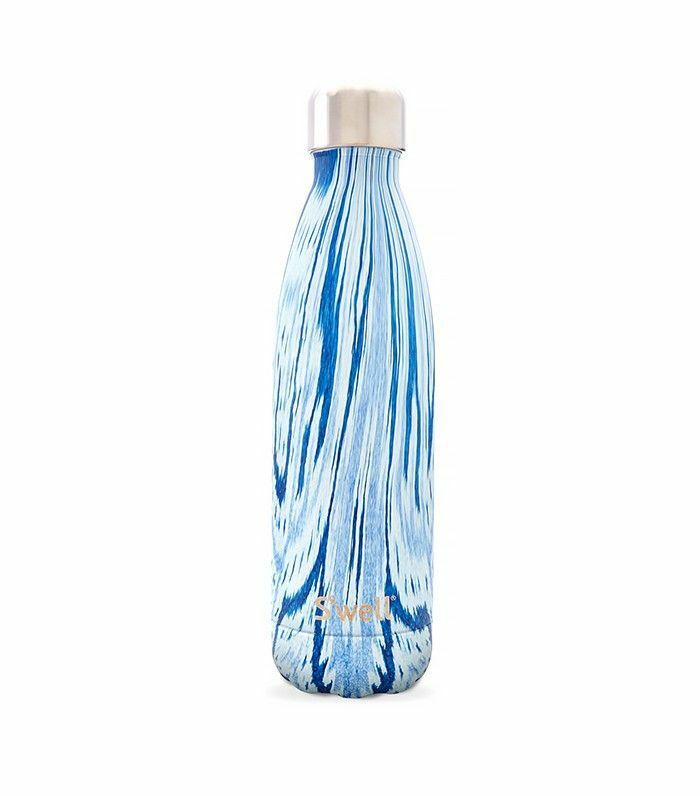 For hydration at our fingertips, we love the ultra-chic S'well water bottles. What are your tips for staying hydrated and looking fresh? Please share in the comments!